What is the recommended gradient for wheelchair ramps in the UK? We quite often receive requests for wheelchair ramps from people who don’t really know how long the ramp should be. 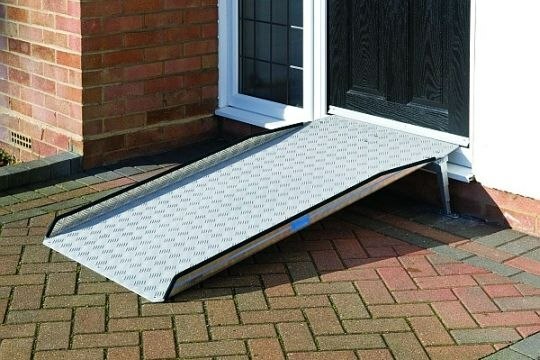 Recommended gradient for portable wheelchair ramps in the UK? As a general rule when using portable wheelchair ramps most ramp manufacturers recommend a gradient no steeper than 1:12 for independent use and 1:8 for assisted use over shorter distances. 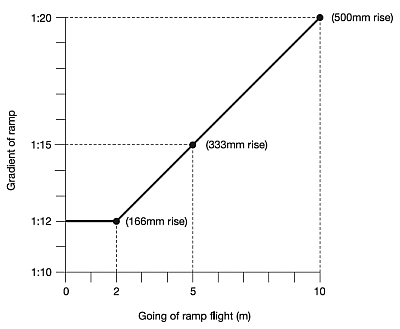 A simple calculation for finding out ramp lengths is to multiple the height by the ratio. i.e. if working on a 1:8 ratio multiply the height of step by 8 to give you the minimum length of ramp. A super lightweight, portable wheelchair ramp with an amazing weight to capacity ratio that makes it the number 1 choice for service providers, employers, retailers, etc. where safety is paramount. Note: always do your own risk assessment before deciding on ramp gradient as guidelines generally say a maximum gradient of 1:12 or 1:15 for public use. Note: 10m is the maximum length a ramp should be before including a level resting platform of 1.5m minimum length. This advice does not take in to consideration the Building Regulations on Wheelchair Ramps which can be found below. Note: UK Building regulations are slightly different with regard Dwellings and other building, these recommendations are for “Buildings Other Than Dwellings”. Is 1.5m wide with a minimum unobstructed width of 1.5m. For goings between 2m and 10m it is acceptable to use a sliding scale i.e. 1:13 for 3m, 1:14 for 4m, 1:16 for 6m, etc. Landings of 1.8m every 10m. Has a continuous suitable handrail on each side. Has a contrasting, landings, upstands and handrails to ramp surface.